You can cut these vegetable and tofu quesadillas into quarters and serve on a small platter. They look so humble, who could know how tasty they are? In a 12-inch skillet, heat 2 tablespoons of the olive oil over medium-high heat. Add the zucchini, tomato, soy sauce, herb, and few grinds of pepper. Cook 5 minutes to soften and brown slightly, stirring a few times. Add the tofu; gently stir to combine and warm. Lay out the tortillas on the work surface and divide the filling equally between them, spreading in an even layer on the lower half of the tortilla. Sprinkle the cheese on top of the vegetable-tofu mixture and fold over to make a half-moon shape. Place the remaining 3 tablespoons of olive oil in a small bowl and lightly brush both sides of the quesadillas with it. Place in the oven and bake until hot, crisped, and cheese is melted, about 8 minutes. 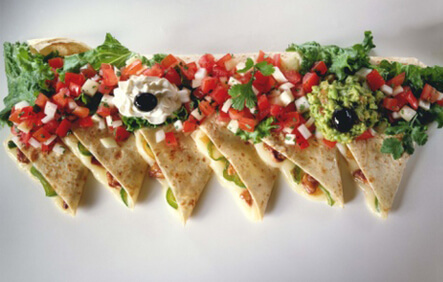 Serve immediately, 2 quesadilla halfmoons for each persons, and cut into halves or thirds, if desired. 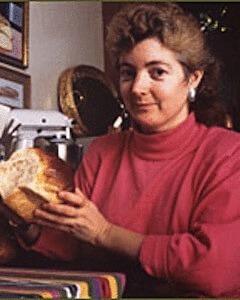 Beth Hensperger is the author of over twenty-two cookbooks, including the James Beard Book Award winner The Bread Bible, and the best-selling Not Your Mother’s Slow Cooker Cookbook series. Also from The Harvard Common Press are The Bread Lover’s Bread Machine Cookbook, The Ultimate Rice Cooker Cookbook, and The Best Quick Breads..